Evolution is a fascinating and exciting strand of the Year 6 science curriculum, encouraging pupils to develop their understanding of the living world and offering many opportunities to explore scientific evidence. It provides pupils with an insight into how ideas and arguments can be supported or refuted by the available evidence, as well as showing them the multi-faceted nature of the scientific community. Have a look at our pick ‘n’ mix ideas for teaching evolution, with suggestions for key teaching content. 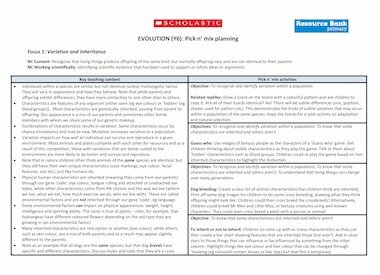 The topic is broken down into four focus areas to enable you to create your own planning block from this array of creative and fun activities for teaching evolution.